Are you looking for a way to enhance the performance of an engine? Getting your intake manifold honed out in Torrance CA may be just what you’re looking for. This process can benefit all kinds of engines, from race cars to motorcycles and even personal watercraft. When a part is honed out in Torrance CA, a small amount of metal--about 1 mm--is removed from the surfaces of the interior passages. While hand honing is possible, it is not the most efficient process. It takes far too long, and it may not reach the deepest interior passages. Abrasive flow machining is faster and easier. All interior surfaces can be reached and smoothed evenly. This is made possible through the use of a specially formulated polymer media that, when pressurized, conforms to the shape of the interior passages and abrades them on all sides. The media is designed to keep the abrasive particles evenly distributed for even surface removal throughout the part. 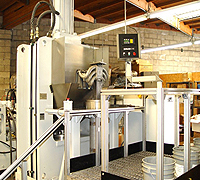 What Kind of Parts Can Be Honed Out in Torrance CA? With the right abrasive media formulation, just about any part that air or fuel flows through can be honed out in Torrance CA. If you only hone out one part, make it your intake manifold as this will deliver the biggest performance gains. Honing is not a solution for headers, however, as honing would weaken the weld and create leaks. Extrude Hone helped to pioneer the abrasive flow machining process for automotive applications over 30 years ago. In fact, we actually introduced Ford to this process in 1992 and today they use it to enhance some of their top models. Thanks to our many years of experience, you can trust us to provide superior quality extrude honing that will remove the exact amount of material you specify. Because our results are always replicable, we can hone parts separately for perfect flow matching. Considering getting your intake manifold or other part honed out in Torrance CA? Call Extrude Hone at (562) 531-2976. We’ll give you all the details on what it costs, how long it takes, and what you need to do to prep your parts.